The scimitar oryx or scimitar-horned oryx (Oryx dammah), also known as the Sahara oryx, is a species of Oryx extinct in the wild since 2000. It formerly inhabited all of North Africa. It has a long taxonomic history since its discovery in 1816 by Lorenz Oken, who named it the Oryx algazel. This straight-horned antelope stands a little more than 3.3 ft at the shoulder. The males weigh 310–460 lb and the females weigh 201–309 lb. The coat is white with a red-brown chest and black markings on the forehead and down the length of the nose. The calves are born with a yellow coat, and the distinguishing marks are initially absent. The coats change to adult coloration at 3–12 months old. The scimitar oryx was once widespread in northern Africa. Its decline began as a result of climate change, and later it was hunted extensively for its horns. Today, it is bred in captivity in special reserves in Tunisia, Morocco and Senegal and on private exotic animal ranches in the Texas Hill Country. The scimitar oryx was domesticated in Ancient Egypt and is believed to have been used as food and sacrificed as offerings to gods. Wealthy people in Ancient Rome also bred them. The use of their valuable hides began in the Middle Ages. The unicorn myth may have originated from sightings of a scimitar oryx with a broken horn. 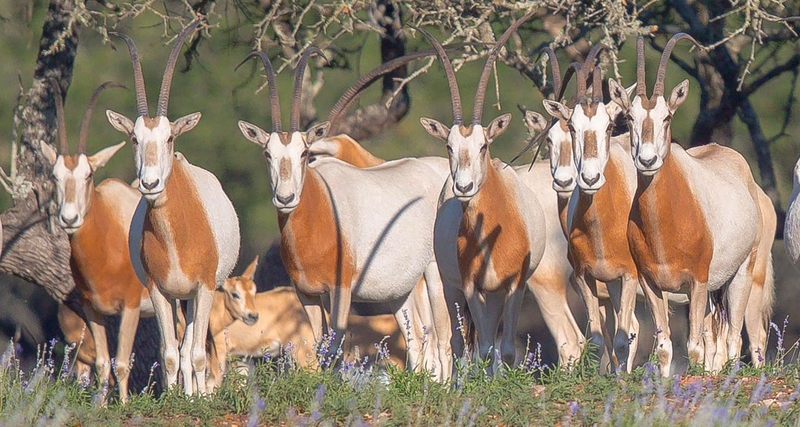 Thanks to conservation minded individuals, the scimitar oryx is thriving in Texas today. Despite being poached to extinction nearly 20 years ago in the deserts of Northern Africa, there are estimated to be more than 11,000 on private ranches in Texas today. This effort helped to test whether scimitar-horned oryx could survive in the wild once again. 23 individuals were released into a remote part of Chad last August. In September, the first calf was born in the wild since the species went extinct. Based on early signs of success, another 23 will be released in January of 2017.